Before turning to specific issues, this article offers a miscellany of C.N. items about draws. The question of whether Rubinstein ever offered a draw was referred to on page 359 of A Chess Omnibus. Remarks such as ‘All rook endgames are drawn’ were discussed in C.N.s 5498, 5585, 5726, 5822 and 10012. Page 3 of the Chess Player booklet Emil Schallopp (Nottingham, 2008) lists the master’s main tournament and match results (1864-1907). The totals are +163 –170 =38, and page 2 comments that ‘one extraordinary feature of Schallopp’s play is his small number of draws in major events’. ‘What is the result of a chess game if both sides play perfectly? With best play, the game of noughts-and-crosses (tic-tac-toe in the USA) should end in a draw, as it is not difficult to demonstrate. In the more complex game of Connect Four, it was shown by exhaustive analysis in 1974 that the first player can force a win. The still more challenging game of gomoku (five in a row) was solved by computer in 1994, showing that the first player may again force a win with best play. But what about chess? 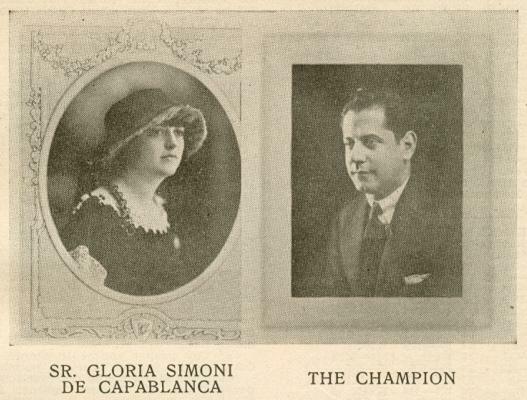 The article also appeared on pages 134-137 of the June 1919 La Stratégie. Page 299 of the September 1919 BCM noted Roussy’s conclusion that White wins a perfectly played game but remarked that ‘M. Roussy does not go so far as to produce an example of a game perfectly played by both sides, in which the victory goes to White’. A book prize was offered by the BCM to ‘the reader who shall be adjudged to have sent in the nearest approach to “perfection”’. Regarding that game, see pages 142-143 of A Chess Omnibus. 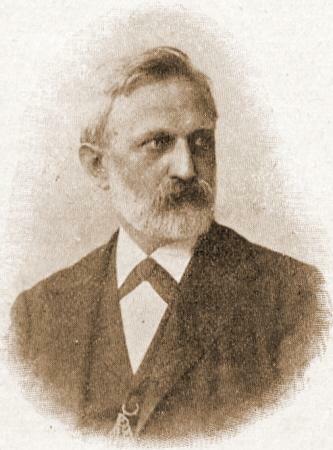 ‘The two drawn games which Messrs. Weiss and Chigorin performed, we will not say played, on Thursday and Friday of last week, while in the effort to break their tie for first place, added no glory to the history of chess. Under such deliberate attempts at a draw, chess is put behind the game that ranks next to it, checkers, in which drawn games are the rule and not the exception. The pusillanimous resignation to rivalry with which each of these two leaders of a great intellectual diversion shrank from the attack, hoping that his adversary would make a mistake, is but another phase of the famous meeting in Canada between Mace and Coburn. Those eminent prize-fighters quartered about the ring for hours because neither was willing to lead for the other, and the affair ended in the same sort of fiasco as these concluding encounters of the chess tournament. Notwithstanding the newspaper’s exhortations, the fourth and final game in the play-off was drawn in 28 moves the next day. C.N. 9480 discussed ‘the most beautiful tournament draw’ (Halprin v Pillsbury, Munich, 1900). Source: Chess Player’s Magazine, 1 August 1867, page 229. See too Stalemate, Repetition of Position or Moves in Chess and Chess: the 50-move Rule. My theory that the Saul text may be the origin of the term “draw” in chess is based on two considerations: 1) it refers to an “indifferent” game, in which many men have been lost, i.e. evidently one without winning prospects; 2) according to the Oxford English Dictionary (definition number 37) the term “draw the stakes” referred at that time (before 1614) to a situation in sport in which one (with)drew either the stakes or an entry (such as a horse) from the competition. I suggest that by 1614 chessplayers were modifying that sporting meaning slightly to allow a player to “draw the stakes” (i.e. withdraw them) if a game in progress reached a simple endgame that clearly could not be won, as Saul describes. In 1640 Joseph Barbier published a revised edition of Saul’s book. It was, in fact, a substantial rewrite which contained at least as much Barbier as it did Saul. 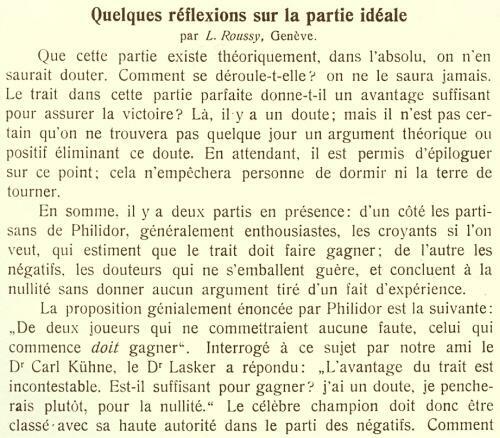 Barbier omitted the passage from Saul referring to “draw the stakes”, but included a point with similar meaning in his proposed code of laws, in which he used the term “dead game” but not the word “draw”. 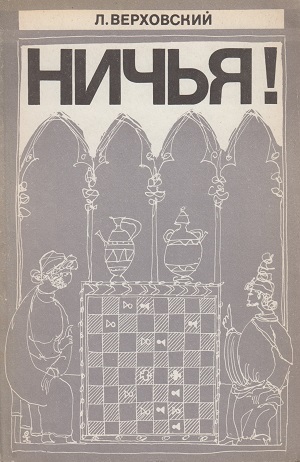 At one point, Barbier defined “dead game” as a king versus king ending, but within a context that would apply just as well to any simplified, drawn ending. 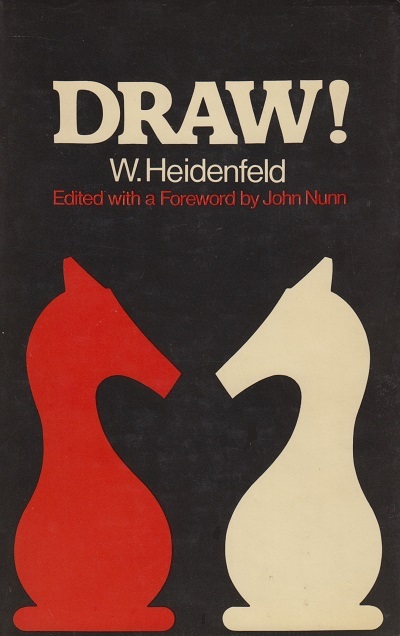 Since “dead game” was also used by Saul in his passage, I believe that Barbier’s terminology tends to support the idea that Saul’s use of “draw the stakes” in a passage that also referred to “dead game” was, in fact, a new application of the sporting term “draw the stakes” to drawn endgames in chess, and thus possibly the origin of our term “draw”. ‘In C.N. 4666 I set out my theory that the word “draw” comes from a rule expressed in 1614 in Arthur Saul’s The Famous Game of Chesse-Play. That rule, given verbatim in C.N. 4666, states that a player may “draw stakes” (withdraw from the game) in an “indifferent” game with few men left and no winning prospects. To avoid abuse of this practice, the opponent could increase the stakes and guarantee to win. The tournament results on pages 8-9 gave the scores with the half-points included. ‘For instance, the phrase “draws do not count” in match play has meant different things at different times; in the first American Chess Congress, at New York in 1857 (to name but one early event) drawn games did not count even for purposes of alternating colors, so that two players who drew played their next game with the same colors as in the draw, until a decisive result was scored. Only after decisive results were colors alternated. Many descriptions of nineteenth-century tournaments also mention that drawn games had to be replayed, but without indicating whether colors were alternated for the replay. Other oddities include the Paris, 1900 tournament, in which draws were replayed once only, with alternation of colors, but a second draw stood as the final result. Do readers know of any systematic treatment of this matter? The identical wording turned up on page 6 of Chess Results, 1901-1920 by Gino Di Felice (Jefferson, 2006). In case of a draw at Monte Carlo, 1901 there was alternation of colours for the second game. See, for instance, A.J. Gillam’s booklet on the tournament (Nottingham, 1995) and, in particular, the discussion of the experimental scoring system on pages 67-70. ‘In early events the English rule was that a player retained the first move for the next game when a game had been drawn. This did not necessarily mean keeping the same color, as the rule that White moves first was not fully established until later. That rule was in effect for the McDonnell-Labourdonnais games, because it was “according to the English law” (page 374 of the fourth volume of the Chess Player’s Chronicle, 1843). Staunton’s The Chess-Player’s Handbook (London, 1847) stated on page 36 that players alternate the first move, except that “If a game be drawn, the player who began it has the first move or [sic] the following one”. This is presumably why the First American Chess Congress (New York, 1857) used this rule, as page 63 of that tournament book stated that the Code in Staunton’s Handbook would govern play, adding on page 64, “Drawn games are not to be counted”. However, a movement to change this rule was evident as early as 1844. Page 156 of that year’s Chess Player’s Chronicle (volume five) noted that the match between Stanley and Schulten in New York required the first move to alternate even in case of draws. On pages 252-253 of that same volume a correspondent advocated requiring that the first move alternate even in case of draws. Staunton expressed agreement with that change, which he said was already the rule in France and, he believed, throughout the continent. Thus, it seems that Staunton’s publication of the old rule in his Handbook was based on earlier codes, and not necessarily on his own opinion. ‘Mr P.N. Wallis proposes that a draw should count only one-third as much as a win. This is intended to penalize the player who adopts stodgy drawing variations. To me it seems that it might have the opposite effect. Suppose an enterprising player meets a draw-minded opponent, he is faced with a difficult problem. If he ventures on risky play to avoid a draw ... he runs great danger of losing and handing an easy three points to the very type of player Mr Wallis wants to penalize. ‘R.W. Ives (CHESS, 30 September) did not realize that James Mason’s proposal to award 1,0 and minus a half for a win, draw and loss respectively is mathematically exactly the same as P.N. Wallis’s proposal to count a draw as worth one third of a win. This is easily seen if you add a half to every player’s score in every game, irrespective of his result (this cannot affect the positions). You then get 1½, ½, 0; or, eliminating fractions, 3, 1, 0, which is Mr Wallis’s system. Less drastic, of course, would be 5, 2, 0. Mathematically, there is no objection whatever to penalizing draws. ‘In your “drab draws” correspondence C.J.S. Purdy writes: “Admittedly, many draws are genuine, and it is a drawback that all would be equally penalized. But not as great an evil as arranged draws, which give some players extra rest days.” It is hard to believe that your correspondent is serious in his suggestion that draws of whatever nature should be “penalized”, seeing that chess – like cricket – is a game that allows for a very wide drawing margin; a game that regards players as equal who are merely “approximately equal” and that does not insist that differences of split seconds or fractions of inches in performance are to be rewarded by plus and minus signs. In athletics “draws” are few and far between; in tennis they do not exist at all; and it would have been simple enough to have chess decided on similar lines. It is clearly illogical not to object to one player trying to draw, but to object to both players trying to draw – if the draw serves the purpose of both. Playing in a tournament, your object is not to win the game – any game – but to win the tournament; and where playing for a win at all cost does not conform to this aim, even the temptation to do so must be firmly resisted. In fact, the ability to resist this temptation is part of a successful player’s technique. Some of the most glorious strokes of cricket may have to remain unplayed – some of the most imaginative games of chess to remain unconceived – because the player has the will to win ... the match or the tournament. In other words, it is exactly the will to win that may dictate to you the necessity of drawing an individual game. Players who do not possess this will to win may indulge their fancy at leisure – but they hardly deserve to get an extra bonus for it. Leaving aside the special case of the “drab” draw, I believe that masters and annotators have a lot to answer for the [sic] general contempt of “drawn games”. It does not suit their book to annotate such games – because obviously it is far more difficult to assess a good fighting draw correctly than it is to come to definite conclusions regarding the merits of a won and lost game. In the latter, the fact that one side lost is in itself a clear indication of some inferior moves somewhere or another. But in a drawn game – did White stand to win? Did Black? Or was what Lasker called the Remisbreite never exceeded all through the game? Looking at draws without passion or emotion, one must surely realize that they are the best chess games of all. The best draws must be better games than the best wins – neither side made a mistake sufficiently serious to enable the other, even with best play, to swing the balance in his favour. Yet how many anthologies of famous games have such draws? Games like Alekhine v Réti, Vienna, 1922 or Alekhine v Marshall, New York, 1924? At best very short games of this nature, like the famous draw between Pillsbury and Halprin at Munich, 1900, or the equally famous first encounter between Botvinnik and Alekhine at Nottingham, 1936, are “tolerated”. If, in such games, the defender had been a little less alert, had lost his way, no matter how slightly, just once, they would rank among the very best specimens of fighting chess. And because the defence was perfect they don’t? Is this the famed chess players’ logic? Regarding Draw! 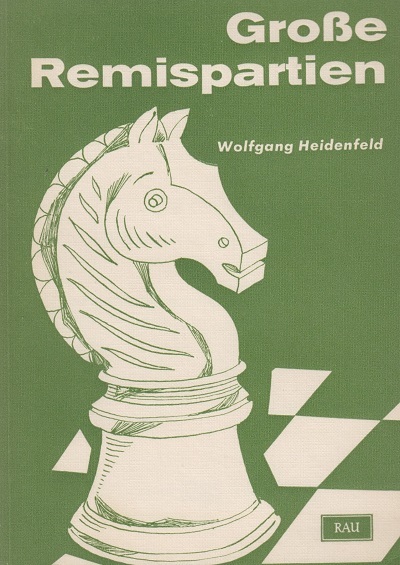 by Wolfgang Heidenfeld, see page 234 of Chess Explorations, which gave a selection of quotations. ‘Drawn games have a poor press. Far too often the result is reached without a fight: the players do not want to play chess but score half a point. The mistakes in players’ names and game venues in Draw! by Leonid Verkhovsky (Milford, 2014) are so numerous and obvious that we do not intend to list examples unless challenged to do so. The imprint page states, ‘Editing and proofreading by Peter Kurzdorger’. A former Editor of Chess Life is Peter Kurzdorfer. Siegrun Macgilchrist (Maybole, Scotland) asks for biographical information on Leonid Verkhovsky. 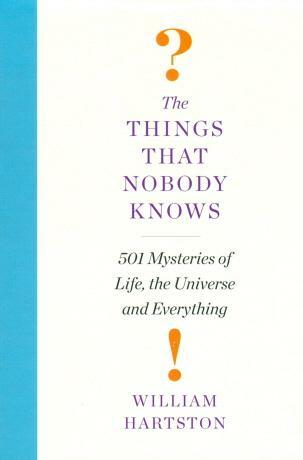 Can readers suggest any particularly good sources? Verkhovsky is best known for his 1972 book Nichya! ; a Spanish translation, Tablas, was published the following year. 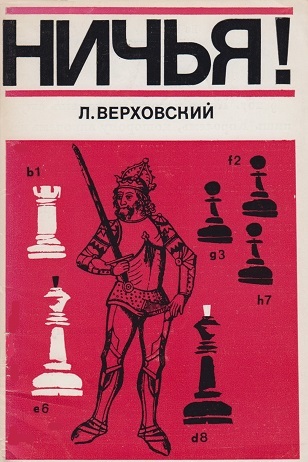 A second Russian-language edition appeared in 1979; regarding the shoddy English version (Milford, 2014) see C.N. 9098. 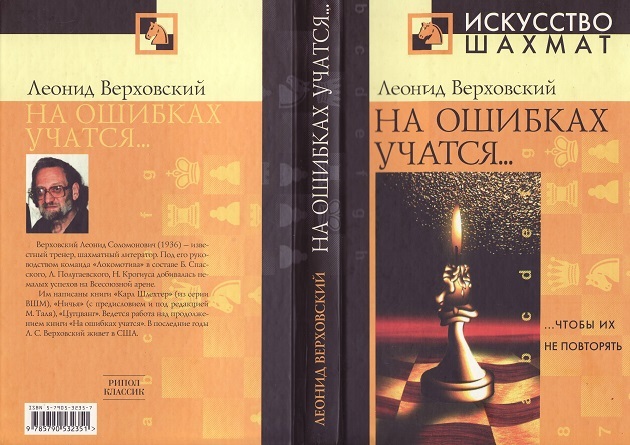 Verkhovsky also wrote a book on Zugzwang (Moscow, 1989), and an Italian translation came out in 1992. 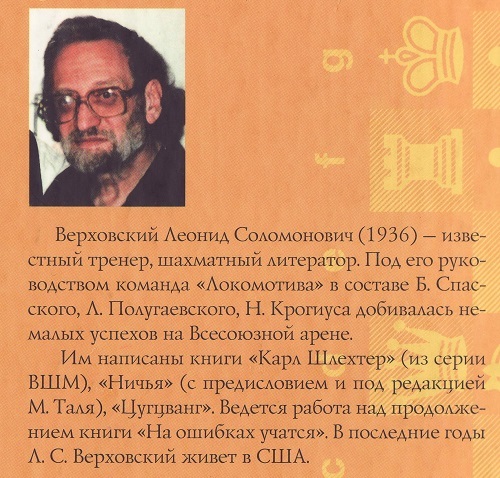 Another work is a monograph on Schlechter (Moscow, 1984), with a Foreword by Lev Polugayevsky. Dan Scoones (Port Coquitlam, BC, Canada) draws attention to a webpage about Evgeny Gik with references to Verkhovsky having died and another Russian page featuring a photograph of Verkhovsky with Vladimir Lepeshkin. See pages 190-191 of Kings, Commoners and Knaves and C.N. 9090. ‘... a phrase like “Alekhine’s Best Games” is really ambiguous: it may mean two entirely different things, viz. (a) the games Alekhine played best and (b) the objectively best games in which Alekhine was a participant (in which the standard of the game is achieved by both partners) – thus he need not necessarily have won them. This, in fact, is the basis of my anthology Grosse Remispartien. At Bournemouth, 1939 Gerald Abrahams finished last with a single point, derived from a long win (available in various databases) against Mieses in the second round. CHESS, October 1939 (page 3) reported that during the game Mieses refused a draw five times. Do readers know of comparable cases of multiple refusals? See too page 359 of A Chess Omnibus. Cases of an early agreement to a draw were discussed in C.Ns. 8162, 8167 and 8169. When was the term ‘grandmaster draw’ coined? 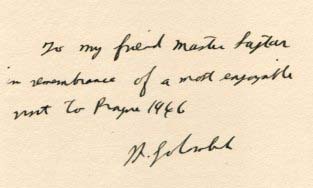 On the first page of the Introduction to his book Prague 1946 (Sutton Coldfield, circa 1951) H. Golombek wrote: ‘the number of so-called “grandmaster draws” can be counted on the fingers of one hand.’ How much further back can the phrase be traced? We have found some occurrences of ‘grandmaster draw’ from 1948 (i.e. a couple of years before FIDE officially brought in the title ‘grandmaster’). Wanted: nominations concerning lengthy matches devoid of draws. Source: The Times, 19 July 1922, page 15. Latest update: 28 November 2018.